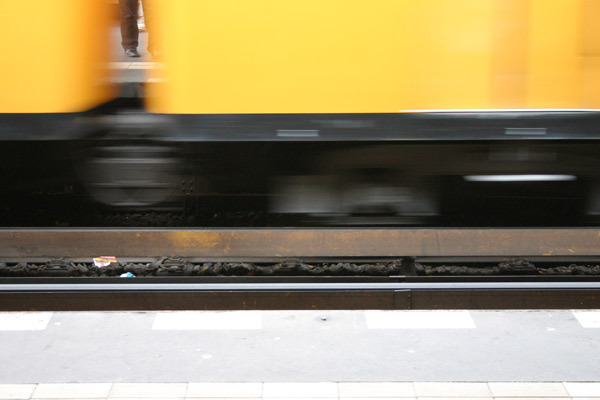 a yellow train in berlin. a few years ago a friend showed me pictures of when she lived there, then starting from almost two years ago i kept hearing about it almost weekly from people who went there over and over and over again. now i understand why. looking forward to going back. when i landed it felt like i was in a dream for a few hours. something about the light, the language, the buses, the clouds, the sky, the people, the new / oldness about it all affected me for a while. i felt as if i was looking at the city the same style that i had seen used in photos found on flickr (user: svane). when i visited new york for the first time it was all so familiar – the sights and sounds, the places – the city felt as if i had known it for ages and that i was in someway living out the stories i had heard so many times before. berlin though for me was new. i knew nothing of it save the few usual placenames. typically i got to see about 5% of what i had planned to, next time i will stay longer.